Non enveloped, icosahedral, non-turreted virion with a triple capsid structure, about 90-95 nm in diameter. 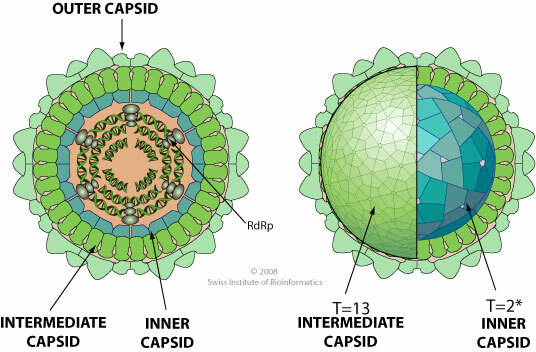 The intermediate capsid has a T=13 icosahedral symmetry, the inner capsid a T=2* icosahedral symmetry. Segmented linear dsRNA genome. Contains 11 segments encoding for at least 11 proteins. Segment 1 of MpRV is 5.8 kb long, the longest segment of any of the characterized reoviruses. ETYMOLOGY Mimo: from type species "Micro monas pusilla reovirus"